When your child has outgrown his car seat, you may be tempted to see him as a big boy or girl. Even if you do see that, though, you can’t forget that, from time to time, he or she will still need an extra “boost” to keep him safe. In the car, that extra safety will come in the form of a booster seat. There are several types and brands to choose from, and you’ll want to make sure you’re getting the one that’s best for him (and you), so don’t pick his booster seat without looking carefully. We reviewed dozens of car booster seats to identify the best of the best. We looked at safety features and comfort as well as convenience and longevity. You may find your needs are specific and partial to one booster type or brand, but when we took an objective look at all these features, we were able to pick out a few that were a cut above the others. If you find you need to be pointed in the right direction when looking for your car booster seat, look no further, we’ve done the legwork for you and listed our top picks below. While there are rock stars in each booster category, there was one clear winner that stood above the rest. The Chicco KidFit 2-in-1 Belt-Positioning Booster has the best features that will protect your child for a long time indeed. We’re particularly fond of its many configurations that allow it to grow with your child. Who Should Buy a Car Booster Seat? The Chicco KidFit 2-in-1 Belt-Positioning Booster is a high back booster that you can install in less than 10 minutes from box to driving away. In fact, you’ll spend more time adjusting it to your child’s specific size than actually installing it into the car. (There are ten levels of adjustment!) It locks in place with a rigid latch that secures to the car’s seat hooks with reliable stability, and it will recline for a more comfortable ride. The two cup holders are soft-sided and removable so you can fold them in or take them off if you need a bit extra space, or just if your child’s making a big to-do of playing with them. The DuoZone head and shoulder protection provides a safety barrier for your child’s entire back and also from side impact. 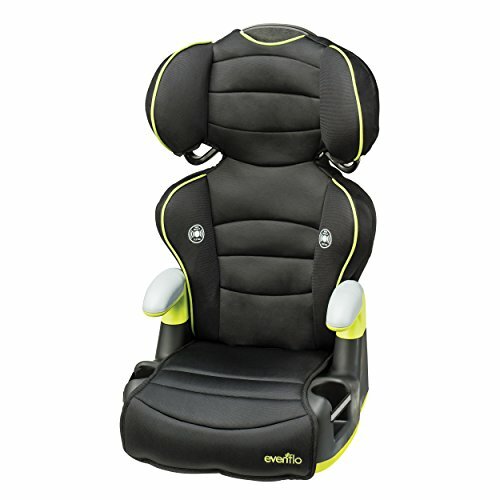 The seat is contoured and double padded, so your kiddo can enjoy all that safety with comfort. And when it’s time, then the back can be removed for a backless booster, as well. The Graco Affix Backless Youth Booster Car Seat with Latch System is an ideal pick if you’re in the market for a seat for your already big kid. There are plenty of selling points for safety with its latching system to lock the seat directly into the car’s seat, securing your child and seat, even when unoccupied. That way, you won’t have to worry about any sliding around with or without your child. It is side-impact tested and designed to meet or exceed all US safety regulations. Even with all its safety features aside, though, you still won’t need to worry about the comfort of your child or its convenience. There are fun features like a hidden tray for your child to store all kinds of goodies and a cup holder so he can hold his own drink as you’re driving. And the fabric is entirely removable, so washing any messes made is a breeze for you. With over 400 reviews and more than 90% of those being 4 and 5-star reviews, you can trust this is a seat that will get the job done. 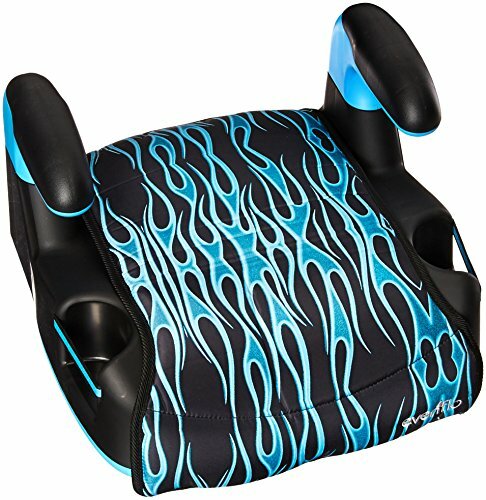 In fact, the Affix Amazon’s choice for “Backless Booster Seat,” with an impressive 4.6-star rating. If safety on a budget is your concern, look no further than the Evenflo AMP Select Car Booster Seat that exceeds the federal crash test standard for structural integrity by approximately double – for just over $30. The pad provides a comfortable cushioned support that will offer your child comfort even for long trips. The weight range is from 40 to 110 pounds and height is recommended between 40 and 57 inches. There are divots in each side of the seat and elastic bands for cup holders that are flush and completely out of the way when not in use, and you (or your child) can pick what design you want. The seat pad is washable and removable, and the hard plastic shell is easily wiped clean so you won’t have to worry about any messes being permanent. This Evenflo Big Kid High Back Booster is an excellent fit for your preschool and young school-age child within the range of 30 to 110 pounds. It adjusts in 6 different height positions, and once your child outgrows the high back, it is removable to become backless, making this one seat useful for even longer. With each height adjustment, it will continue offer support to your child’s head and neck. It meets or exceeds all federal safety standards as well as Evenflo’s side impact testing standards. The energy-absorbing foam offers a comfortable ride for your child and the fabric is easily removed and machine washable so you can clean up any potential messes in a breeze. The cup holders on either side are created with an elastic band that is flush to the side when not in use. With more than 4,000 reviews and a rating on Amazon of 4.5, there’s a high probability that this high back booster will satisfy your needs and leave little room for complaint. And at just over $35, it’s an absolute steal. 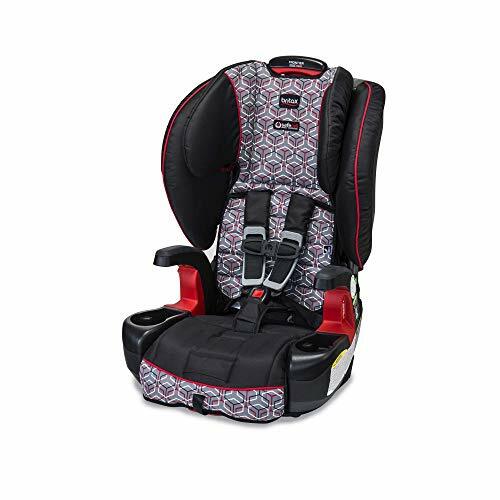 The Britax Frontier Clicktight Combination Harness-2-Booster Car Seat is an excellent choice if you’re starting the booster set-up from the beginning of your child’s size range because you can still use a harness to provide maximum protection. As your child grows, you can adjust your booster to keep providing the best protection. 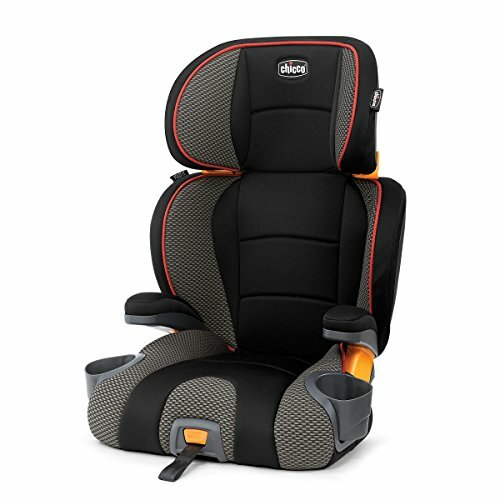 The back and headrest are each adjustable, and the SafeCell Impact protection includes an energy absorbent base, impact-absorbing tether and a steel frame to keep your child safe, even if an accident happens. The ClickTight latch makes installation of this car seat a piece of cake; it’s just a matter of buckling it directly into the car. It also reclines in multiple positions to provide maximum comfort and has two removable cup holders to allow your child to take care of his own things. With a rating of 4.6 and nearly 1,000 reviews, the chances are you’ll keep this booster seat for the duration – and because it adjusts to your child’s size, the chances are that will be for several years to come. Booster seats are a requirement if you plan on taking your children anywhere in the car. Not only are they safer, but it’s also a requirement by law. Boosters are designed to “boost” the child’s height to make the seat belt fit properly. However, several booster seats will also come with harnesses, in case the child is somewhere in-between sizes. High backed boosters will also provide head and neck support which will be very important in even the smallest fender bender. Whiplash for a child is a serious concern, and any measure of protection is worthwhile. The backless booster is generally for your older school-aged child who won’t fit in a backed booster any longer but is still too short to fit in your car’s seat belt with the lap belt across their lap (not belly) and the chest belt coming across the chest (not face or neck). Getting a convertible booster will most likely be the best bet for prolonged use, but if you have specific needs, then you may need a more specific seat. The root of the answer to the question “Who should buy a car booster seat?” is: Every parent at some point. A booster is a vital way to keep your child safe and just like you wouldn’t skimp on baby proofing the chemicals under the sink, you shouldn’t skimp on the car safety, either. Harness. For a child who is close to needing a high back booster but would still benefit from the added safety of a harness, you’ll want to take a look at a booster with a harness option as well. Depending on how close he is to no longer needing a harness, you may want to get one that will transition. If he’ll be in the harnessed booster for a while, though, (or you have additional children that will take over his seat as he grows), then you may want to get a strictly harnessed booster. Backless. Your child will outgrow the high backed seats long before she can fit safely in your car without additional support, so you’ll need to keep that in mind when you’re picking out your booster. You’ll need to do your measurements to ensure you’re getting what makes sense. If she’s too small for just a backless booster, you’ll need to get one that is at least high backed. If she’s on the line between needing a back and not, you’ll likely be best served to get a booster that will transition to backless as the high back is removable. Cup holders and storage. This may seem like a minor feature, but when you’re driving own the road and your child repeatedly asks you to reach back to hand them something you’ll regret not thinking this feature through. Having a place for his cup and a snack may keep you on the road for longer during a road trip, and any way you can prevent unnecessary stops is worth considering. Adjustable parts. Not all children are built the same, and as such, it’s unrealistic to think that every seat will fit every child. Every part of a car seat that adjusts will make it more comfortable and more suited for your individual child. That will very likely mean that every adjustment made for it to fit your child means it will be all the safer. Of course, keep in mind adjustments involve moving parts and moving parts do break – so keep an eye out to make sure your booster is always in working order. Height and weight limitations. If you have one child and you want to get the most use of a booster, you’ll need to make sure you’re getting a seat with the broadest range of height and weight capacity. Otherwise, just keep track of your child’s growth to make sure they’re not staying in a seat longer than is safe. Safety regulations. You’ll want to make sure your car booster seat is safe, so take a good look at how it has performed in safety tests or that it meets all the recommendations and requirements set forth by the National Highway Highway Traffic Safety Administration. You can find a summary of those regulations and links to more specific regulations from different government agencies on the Crash Test website. Expiration. Most car and booster seats now have an expiration date. This date is determined by the decomposition of all the pieces and parts the seat is made of and assumes an accident-free life cycle. Accidents negate expiration, and while each seat may have different specifics, they don’t all include them (yet). If that is the case, the assumption must be that the seat expires 6 years from the date of manufacture. You can find these dates on the underside of the seat itself. When can a child be in a backless booster seat? As a general rule, if your child can fit into a harness, he or she is safer there. So if she could fit into one, then she should probably be in one. There are recommended minimums, though, that you should keep in mind; both height and weight. Any child under 4’9″ (and at least 35″) should be in a booster. He should also be within the range of 40-80 pounds. There are no age recommendations, but typically these standards fit children between the ages of 4 and 8 years old. When can a child go into a booster seat? While, again, you should keep your child in a car seat as long as she fits, there are a few milestones in growth that will allow you to start thinking about transitioning to a booster. When her shoulders exceed the height of the harness straps, then it is time to transition her to a booster that complements the use of the car’s seat belt. She should also be at least 40 pounds and 4 years old before she makes the switch away from a traditional harnessed booster or car seat. What is the law for booster seats? The laws regarding car seats often have less than specific wording and each state has a particular code. You’ll need to check your own state’s regulations to be sure of the specifics. Due to this, there is no hard and fast blanket answer to this question. But you can be sure that the law is written for minimum requirements and should not be taken as a rule for when your child should graduate to the next step in car seat safety. For example, the ages are often 4 and under in a harnessed seat, and a booster until 8. But that does not mean your 4-year-old needs to be in a booster or that your 8 year old will be safe without one. Keep them in the seat that is safest for their size, regardless of their age. When can I take my child out of a booster seat? Each booster seat has limitations, and you’ll need to read your specific seat’s capacities to know the answer to this. Keep your child in the booster seat until she has exceeded either the weight capacity or the height restrictions, and not before. Typically children reach this size between 8 and 12 so you’re probably safe not looking for a significant change in seating until your child is at least 8 years old. We looked at 20 other car booster seats and even though they didn’t make our 5 best boosters list, they’re the best of the rest, and each is still an excellent option for your child. The information you’ll need to compare each one is included with the listing. This high backed booster seat has all your big kid will need for safety. When he’s not big enough to go without but too big for a standard car seat, you can strap him in with a car seat belt, secure it with the lap belt adjuster, and he’s good to go. The seat itself has 3 layers of side impact cushions, and removable cup holders ensure a comfortable ride for your little one. Not only will this seat keep your child safe while she’s in it, but it will keep you safe while she isn’t. The ISOFLEX latch connection system secures the seat and prevents it becoming a projectile in the case of an accident. Combined with its SafeCell Impact Protection that provides an extra layer of side impact protection, you can count on this seat to be a safe one. This high back seat will not only be a comfortable ride for your child; it’s one that has plenty of features to convince you, as well. The SuperCinch LATCH attachment secures your child snug and comfortable with just one pull, and the DuoZone offers combined head and shoulder side-impact protection. The cup holders fold in when not in use, or are entirely removable while the Zip&Wash cover allows you to remove the entire cover in two pieces and is machine washable for ultimate convenience. This car booster reclines, and the headrest adjusts, so if you want to make sure it’s ultra comfortable for your child’s nap on a road trip, you absolutely can. You won’t need to worry about safety while your child is in this booster either, because its substructure is entirely metal and the latch system is sufficiently rigid, keeping it secure. The headrest is connected to the base with steel rods to reduce twisting or movement, and the expiration of this car seat is a full 9 years. This high back booster is designed for your school-aged child at least 30 pounds and between the height of 40-57 inches. The back adjusts to 6 different positions making it a seat that grows with your child and allows you to get your full money’s worth from your purchase. This booster has a fully adjustable headrest and is made with a durable and extra safe metal and plastic construction. It’s also side impact tested and engineered to meet or exceed US standard safety regulations. Its latch system makes installation an absolute breeze; simply buckle into the car, and you’re set. This booster is an excellent option for your child ranging in height from 40-57 inches. It has been thoroughly tested to meet or exceed all US safety standards, and its structural integrity is tested with twice the required force. It also grows with your child by removing the back for a backless booster for even longer use. This booster is such a simple solution for your just-in-case moments. This inflatable booster folds up so small that you can slip it under the seat and merely forget about it until you need it It’s a convenient solution for grandparents or a secondary car that is perfect for your day to day, too, should you need your car for more than just parenting. This booster is Amazon’s choice for a backless booster seat and with a pretty solid justification! It has a rating of 4.5 and is just under $40. The fabric is removable and machine washable, the cup holders are soft and removable, and with the integrated lap belt guides and shoulder belt clip it is fantastically convenient. And another big perk: It has a built-in handle on the back, making the transfer from car to car a snap. This booster is a simple design with a lot of little bonuses. The latch system makes the installation quick and painless, and the extra padding in the seat makes the ride a much smoother one for your child. It’s easily portable with a strap that tucks in the bottom and allows you to carry it over your shoulder and hands-free. And the fabric comes off and can go straight to the washing machine for a quick clean up. This booster has been specially designed to not cause any marks on your car’s seat with no indents or scratches. And you can almost tell that just by its sleek design and rounded edges. It’s engineered to fit your child ranging in height from 43 to 47 inches, and the padded seat is extra plush for maximum comfort. This little seat has all the basics you probably imagine in “booster seat,” and that’s very likely why it’s Amazon’s choice for “Booster Seat.” It also has nearly 2,000 reviews and a rating of 4.6 so you know there’s something to be said for this seat. The armrests are padded and adjustable for your child’s height so it will grow with him and the cup holders will provide him a bit of independence. This backless booster is the perfect booster for the superhero-loving child in your life. There are 6 options, Superman, Supergirl, Batman, Batgirl, Teenage Mutant Ninja Turtles, and Wonder Woman. A rigid cup holder makes it easy for your child to store and take care of his own drinks or small toys and that little convenience can be a big help. This harnessed booster transitions to a high back booster as your child grows and when using the harness, you can use this seat for children as light as 25 pounds. It is generally for kids on the lighter side, but adhering to the weight limitations (25 pounds minimum for the harness, 40 pounds minimum for the booster; 110 max for the seat) this seat can be an excellent option for your car and child. This harnessed booster transitions into a seat belt booster and high back with ease. The seat has seat belt guides to ensure the seat belt sits where it should on your child and the harness is perfect for your child who is not quite ready to be strapped with the car’s belt. Its narrow design will also allow you to situate it 3 across most vehicles if you have the need. This booster is the ultimate in convertible car seats. You can use this from the get-go: it’s rated safe for babies as small as 5 pounds. Because of how open it appears, you may not expect it, but it does configure rear facing for even your newborn. A huge selling point for this car seat is how slim it is: only 16 inches across. So if you have a big family or need to sit 3 seats across in your car, this may be worth a look. It also folds up, and the cup holder is removable, making it an incredibly portable seat. This booster combination seat reaches some of the lowest weight with its minimum weight of 22 pounds, but the maximum is the most common: 110 pounds. Similarly, the height minimum is a bit smaller than its peers at only 28 inches, and the peak is similar; 57 inches. The combination seat is tested for side impact and structural integrity at twice the force level requirements of the US federal crash test standards. So if you want a safe, comfortable ride that will be with your kid for the longest time, this may be worth a look. The harness adjusts to 4 different height positions before you even transition to the seat belt booster which means this booster will stay with your child for a long time coming. It has a latch and tether system that makes installation easy and incredibly secure and once transitioned to full booster and no harness, the seat itself has belt guides that will direct the car’s seat belt to the correct position on your child to optimum safety. 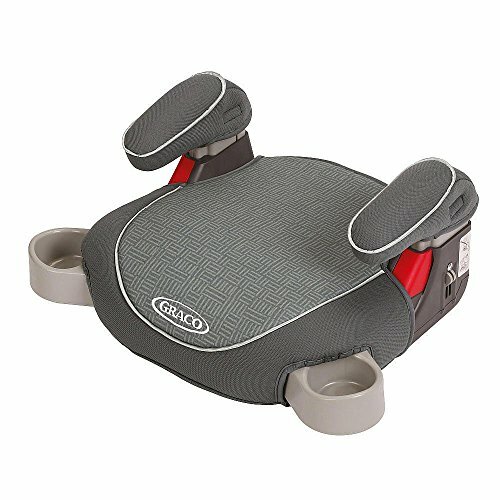 This booster seat will transition from your child at 22 pounds with a harness, offering the most protection and follow her growth with its own adjustments to continue to protect your child as she needs. The high back booster has seat belt guides that position the car’s seat belt appropriately, and the back is removed for when your child has outgrown that, as well. The harness has 8 eight positions and the minimum requirement for weight is 22 pounds, so this is a car seat that will grow with your child. This booster starts with your child at as low as 22 pounds and will transition from a harnessed seat to a high back booster for up to 100 pounds. The booster has guides for the seat belt ensuring its proper fit and the seat itself reclines to make it a comfortable ride for your child, even for long trips. Jenny Jarvis is a contributing writer for FindHow. She has a bachelor's degree in English from The Ohio State University and has been writing since 2015.